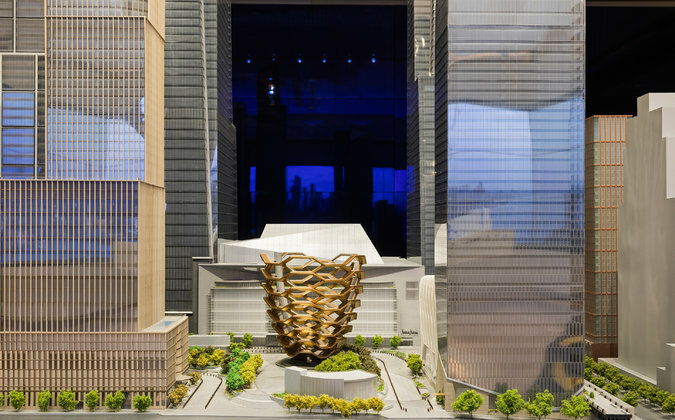 Many of the people involved in developing Hudson Yards, the immense high-rise project that is reshaping the skyline on the Far West Side of Manhattan, refer to it as a new neighborhood. Though it may want for the Jane Jacobs intimacy that usually defines a neighborhood, it will have a mix of apartments, offices, park spaces, schools and cultural attractions. Dry cleaners, drugstores and health clubs will join shiny retail spaces housing international clothing labels. The centerpiece, a copper-color honeycomb Thomas Heatherwick sculpture called “Vessel,” has intertwining staircases open to the public. Hudson Yards will also have plenty of options for eating and drinking, including a European-style food hall and enough local and international marquee names to make it a dining destination. Starting in late 2018, at least 25 places serving food and beverages will open throughout the complex. Kenneth A. Himmel, the president and chief executive of the development group Related Urban, has been working with the chef Thomas Keller to lure big names. (Mr. Himmel’s company created the retail and dining components of the Time Warner Center, where Mr. Keller also has a restaurant, Per Se.) Eight high-profile restaurateurs are already on board, with contracts for another two yet to be signed. The largest concentration of restaurants will be in a central, seven-story building named Shops and Restaurants at Hudson Yards, home to a Neiman Marcus store, which will also have its own restaurants. Thomas Keller In addition to a Bouchon Bakery on the fifth level, the chef and restaurateur will have a restaurant, in all likelihood an American grill with the working title the TAK Room, on the fifth and sixth levels, with outdoor terrace seating. Mr. Keller wants to evoke an earlier era of traditional American fine dining. Estiatorio Milos A high-end Greek seafood restaurant with outdoor seating from the international group owned by Costas Spiliadis will anchor the fifth and sixth floors opposite Mr. Keller’s restaurant. David Chang The chef and restaurateur is working on a two-part project for 5,000 square feet on the fifth floor. In front will be a cafe of some kind, perhaps in the style of his Momofuku Ssam Bar, with a more formal restaurant beyond. “It won’t be like my other restaurants” in New York, Mr. Chang said, though he suggested it might resemble his Toronto restaurant Daisho..
Cipriani A white-tablecloth restaurant from the family with several luxury dining rooms and catering halls in New York, featuring Italian food with a Venetian accent, will be on the fifth floor. Gabby Karan de Felice and Gianpaolo de Felice The couple, who own Tutto Il Giorno in TriBeCa and Southampton, N.Y., will create a casual Italian restaurant (with a different name) on the fifth floor. Michael Lomonaco The New York chef, who has a steakhouse and a bar in the Time Warner Center, plans a gracious but informal 220-seat American restaurant with local and regional classics, on the fourth floor. “It will have an open kitchen, and that’s something I’ve always wanted,” he said. D&D London The London-based group of splashy restaurants expects to open an 11,000-square-foot restauranton the fourth floor. The company has not fine-tuned the concept, but it will include an all-day cafe. Juan Santa Cruz This Buenos Aires restaurateur and designer, who recently opened Isabel in London, has signed on to open a restaurant on the ground floor of this tower on the western side of the development. Equinox Hotel There will be one restaurant in the hotel, and another yet to be selected in the building. José Andrés The chef, who has restaurants in Washington and other cities, will set up a market and food hall for all things Spanish, in a 35,000-square-foot indoor-outdoor space. “It will be in the spirit of markets like Boqueria,” he said, referring to the market in Barcelona. Joining him as partners in this project, which will include bakers, winemakers and other food artisans, will be the renowned Barcelona chefs Ferran and Albert Adrià.